What's Amazing Stock Trend Signal Software (ASTSS)? What stocks can Amazing Stock Trend Signal Software process? What signals are there in Amazing Stock Trend Signal Software? What's 4T stock trading strategy? How the trend signals are alerted in ASTSS? Do you need a key to run ASTSS? Is the trial key the same as the paid key? How to upgrade trial key? How to get key back if I lost it? Where can I download the newest version of ASTSS? How to open the manual? How many threads should I indicate for a stock list? How can I reset ASTSS? I have made payment through PayPal, why my key is still expired? I saw error message "This application has failed to start because the application configuration is incorrect" when starting ASTSS. What should I do? Does ASTSS support forex currency? Does ASTSS support internet proxy server? 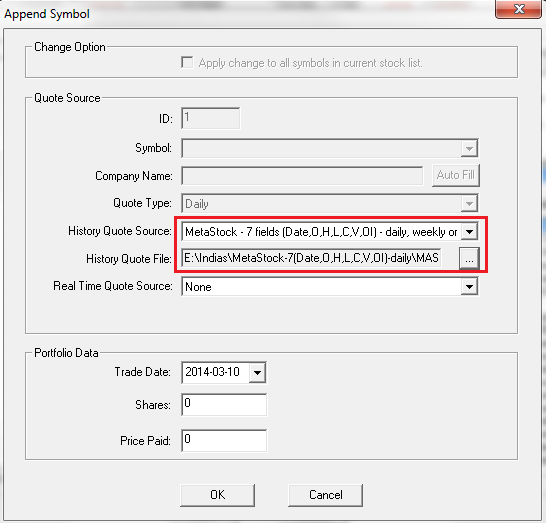 How to import MetaStock quote files? Amazing Stock Trend Signal Software (ASTSS) is designed to help investors to make decision when to buy or sell stocks and what to buy or sell. It catches stock trend change signal in the very early stage when stock trend is changing and it also alerts stock buy sell signal after the stock trend is built. This software is built on invest4y.com's famous 4T stock trading strategy, i.e. wait, hunt, short and profit. It is one of the best stock trend change and buy sell signal software in the stock market. ASTSS can process any stock of all stock exchanges in the world as long as the stock symbol is recognized by Yahoo Finance. Here are some examples. There are only 6 signals in Amazing Stock Trend Signal Software. It is easy to use. Red triangle with yellow background - The trend is chaning from up to down. Investors should pay special attention. It means that the trend is being reversed from up to down, but current stock trend is still up. This signal may disappear if it is not confirmed in the coming trading days. Solid red triangle - The trend has changed from up to down - Investors may considering sell. It means that the current trend is down. Green triangle with yellow background - The trend is chaning from down to up - Investors should pay special attention. It means that the trend is being reversed from down to up, but current stock trend is still down. This signal may disappear if it is not confirmed in the coming trading days. Solid green triangle - The trend has changed from down to up - Investors may considering buy. It means that the current trend is up. 4T stock trading strategy is the 4 steps of trading stocks, i.e. WAIT, HUNT, SHOOT and PROFIT. WAIT - when stock trend is down, i.e. you see red triangle. You shouldn't buy stock but wait. HUNT - When stock trend is changing from down to up, i.e. you see green triangle. You should watch your candidate stocks closely. The buy opportunity may be coming. SHOOT - When buyers are overwhelming, i.e. you see green circle. You can buy some shares now as everybody is buying. PROFIT - Whenever you want. If the stock you have bought is going up, think about locking profit step by step. For example it is good time to lock your profit when you see red triangle or red circle again. If the stock you have bought is going down, you have to stop loss. ASTSS alerts trend signals based on a confirmation model which we developed. It reflects the traders' psychology in the stock market. On day 1 ASTSS calculates trend using today's trading information. If ASTSS catches trend reverse, it alerts a trend changing warning signal, i.e. red triangle with yellow background - stock trend is changing from up to down. These signals mean that the stock trend is being reversed, but previous trend is still intact. On day 2 ASTSS confirms day 1's trend changing warning signal. If the trend changing warning signal is confirmed, ASTSS keeps this signal; otherwise this signal is discarded. On day 3 ASTSS confirms day 1's trend changing warning signal again. If it is NOT confirmed, this signal is discarded; otherwise ASTSS alerts true trend signal, i.e. solid red triangle - the stock is in down trend. These signals mean that the previous stock trend is reversed completely. red circle - sell signal. Buy signal is in up trend. Sell signal is in down trend. Note: When ASTSS is alerting trend signal, it is not necessary to follow the same procedure, i.e. day 1 to day 3 confirmation. It is possible that ASTSS catches all signals in one day which means the stock is very strong. You don't need a key to run Amazing Stock Trend Signal Software, but you will run it in trial mode. The trial key is exactly the same as paid key but ASTSS is running in trial mode. 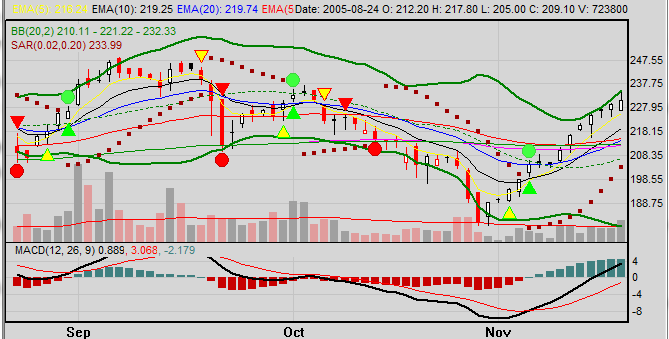 There is no stock trend change signal and buy sell signal on the technical chart in recent 60 days. There are also some other restrictions. You may run ASTSS in trial mode to test your history transactions and evaluate ASTSS. We strongly recommend you to upgrade your trial key so that you have full access to Amazing Stock Trend Signal Software. After you make payment to Invest4y.com successfully, PayPal.com will bring you back to our website. Payment confirmation email from PayPal.com. Run ASTSS again and check your key status by pressing "Config" --> "System Parameter"
We will send your key number to your registered email address. Save the installation program ASTSS-SETUP.exe on your computer. Run ASTSS-SETUP.exe, it will guide you to install ASTSS on your computer automatically. Increasing thread number will speed up downloading real time quote from online website resource, but it will also need more system resources. We recommed one thread for every 100 stock symbols in the stock list. 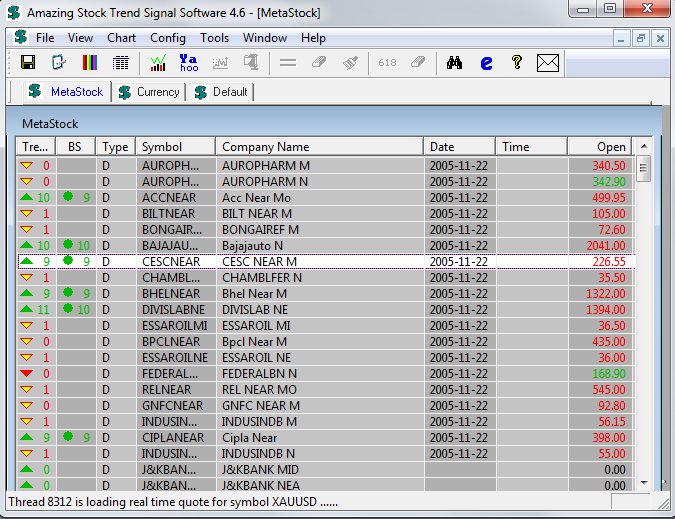 For example, if you have 400 stock symbols in a stock list, indicate 2 threads. Although Amazing Stock Trend Signal Software can handle up to 16 threads for a stock list, we found that 4 threads for a stock list are optimal for most computer system. To restore ASTSS to the original status, i.e. the status after you install ASTSS, just delete the configuration file "Config.ini" in the installation directory. For example "C:\Invest4y.com\ASTSS 2.8.1.2\Config.ini". PayPal, an eBay Company, enables any individual or business with an email address to securely, easily and quickly send and receive payments online. We accept payment through PayPal. You may make payment to us with or without a PayPal account. If you don't have a PayPal account and made payment to us by Credit Card, PayPal won't bring you back to our website automatically. We don't know you have made payment to us, that's why your key is still in expiration status. Please click link "Return to Merchant" on the last page to go back to our website manually when you finish making payment through PayPal. See the last page. Yes. ASTSS does support forex currency pairs recognized by MetaTrader platform, for example USDCAD and XAUUSD etc. ASTSS gets currency quote from MetaTrader 4 servers. The configuration is set automatically. Please follow these steps to make sure MT4 terminal works well on your computer. If you see the dialog which asks you to open account, just click “Cancel”. You may see another login dialog box, just click “Cancel”. Now you see MT4 main window. In the “Server” drop-down list, select “AlpariUK-Demo-Pro - Alpari (UK) Ltd.”. If you can’t find drop-down list, then input server IP address “78.140.180.200”. Input “29596089” in the login field and input “ps1opom” in the password field. Click “X” in the upper-right corner to close ASTSS-terminal. Restart ASTSS-terminal “C:\Invest4y.com\ASTSS 4.7\ MT-WORK2\ASTSS-terminal.exe”. Repeat 1) to 10) but run “C:\Invest4y.com\ASTSS 4.7\MT-WORK1\ASTSS-terminal.exe”. Then restart ASTSS 4.7. You will be asked to input key number again. 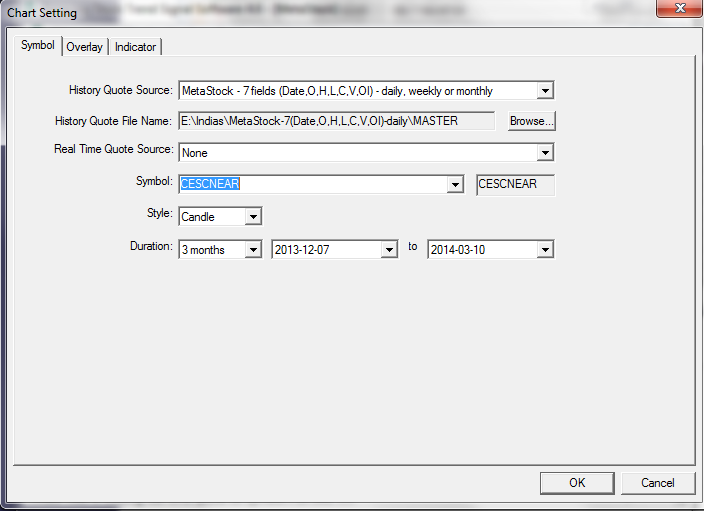 You need identify what format your MetaStock quote file is. 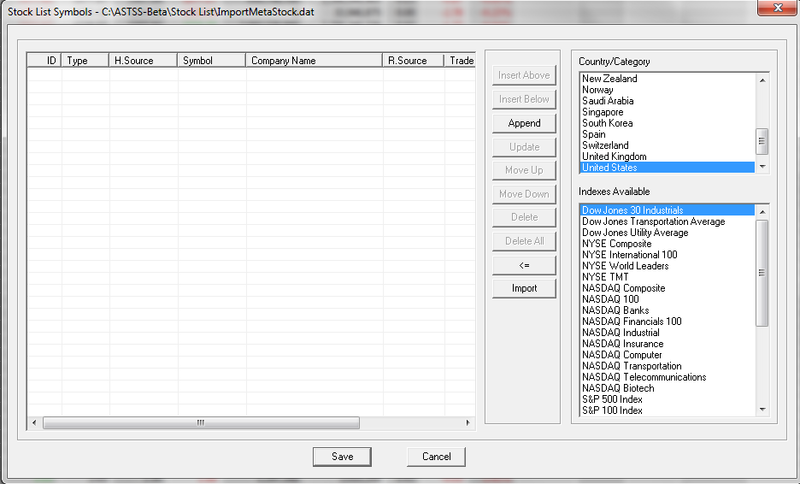 Please follow these steps to create a stock list to import MetaStock quote file. 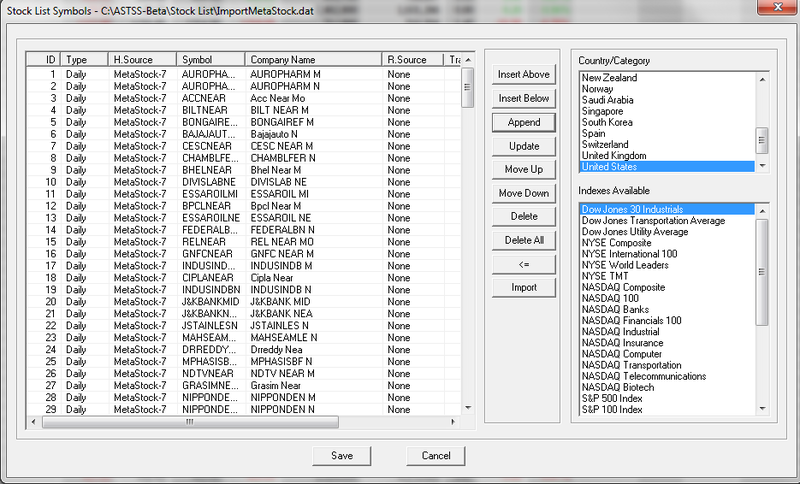 ASTSS loads all stock symbols in the MetaStock file into your stock list. ASTSS loads stock quote for all stock symbols in the MetaStock file. ASTSS calculates trend signals and buy sell signals. You may draw stock charts by pressing key "C".